The Cooper Bussmann Transformer Protection Guide program translates NEC® section 450-3 for overcurrent protection of transformers. 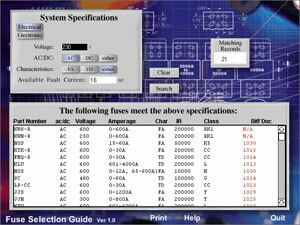 Based upon basic information about a transformer, the program will take you through a flow chart to arrive at the maximum fuse value that can be used for your particular transformer. Works for me without any problems. I’m running Win7. This software is basically flash application and simply there is nothing that cannot work, except if you have broken flash installed on Windows. Try installing newest version of flash from Adobe website. All of installation files of Cooper Bussmann software are corrupted! I downloaded it also on his website but still have error.